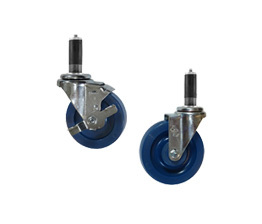 Made to fit a wide range of both square and round tube legs, adapting to tube leg inside diameter. 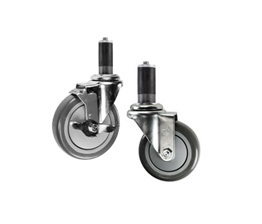 Expanding stem casters are ideal as prep table casters, work table casters, racks and shop projects. 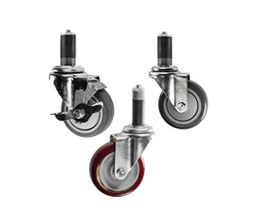 A wide variety of wheel types are available for our expanding stem casters, including non marking, easy rolling polyurethane. 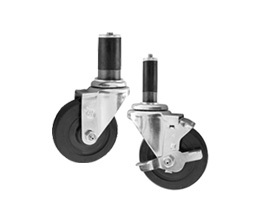 For more information, including custom specifications, please call 1-800-215-8220 to speak with our on-site caster sales staff. Tighten the topmost ring on the expanding caster adapter stem before insertion to compress rubber until it fits snugly into the tube. The expanded stem can be inserted into round or square tubing. 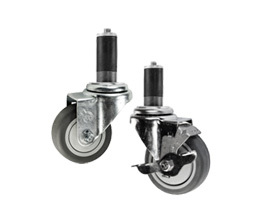 It may be necessary to further tighten the nut under the swivel with a wrench until adequately secured.